Preheat oven to 350°F. Cut zucchini in half lengthwise; scoop out centres and finely chop. Set aside. Place zucchini halves, hollowed sides up, in shallow baking dish. Cook and stir meat and chopped vegetables in dressing in large fry pan until meat is browned. Stir in oregano. Season with salt and pepper to taste. 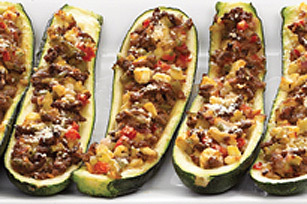 Stir in shredded cheese; spoon evenly into zucchini shells, using about 1/3 cup of the filling in each shell. Sprinkle evenly with Parmesan cheese. For a meatless version, prepare as directed substituting 1 pouch (about 1 cup) simulated ground beef for the browned ground beef.